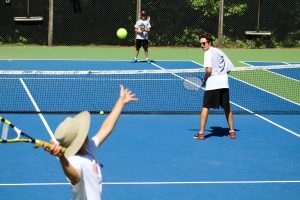 Under the direction of our pro and experienced instructors, tennis provides tremendous instruction for campers, regardless of their skill level. 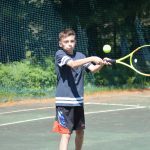 Whether it’s a new camper with no previous playing experience or a veteran camper who is on his school tennis team, this program has something for everybody. 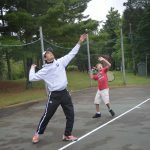 Our objective based program philosophy allows beginning tennis players to work on the basics and as they progress they work on more advanced forehand and backhand techniques. Our instructors use a wide variety of fun exercises to help campers grow as tennis players. We have several program options for our most advanced tennis players. Campers engage in both singles and doubles play on our five tennis courts. Our instructors are a great indication of the quality of our program. Many on our tennis staff are former campers who learned and honed their tennis skills at North Star. We do offer one-on-one lessons with a Tennis Pro and in the winter we open enrollment for those lessons, which are at an additional fee. 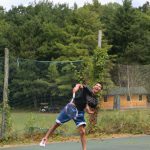 Even for campers who do not sign up for these lessons, the Pro’s expertise is felt by all who sign up for tennis as he works directly with our tennis staff. 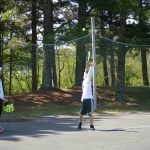 We participate in two tennis competitions with other camps, the Northwoods Tennis Tournament as well as our Bi-Camp competition. Campers also have many opportunities for open tennis play during our 5th period organized frees and at other times.